Background: Rosacea is a chronic inflammatory skin disease that affects 0.5–10% of the population. Common symptoms are redness and itching in the nose bridge area, especially cheeks. The cause is not completely understood but genetics, increased growth of bacteria in the small intestine, and increased activity of Demodex mites are considered responsible. There is no certain cure for it; however, oral antibiotics, including tetracycline and doxycycline, and topical medications including metronidazole gel and azelaic acid cream are effective in improving symptoms. Due to the chronicity of the disease, regular use of these drugs is associated with many complications. The complications of synthetic drugs and the lack of favourable outcome of the treatment have led to increasing prevalence of the treatment approach with traditional medicine. Case Presentation:The patient was a 62-year-old man who complained of redness and pustules on the face. During the illness, he visited numerous doctors, who, after diagnosing rosacea, had prescribed various drugs, but the patient did not consume any of these drugs. After following the dietary recommendations and using herbal medicines, noticeable improvement was achieved after two months. Conclusion: Considering the significant improvement in the patient’s condition after appropriate diet and appropriate use of herbal medicines, it seems that traditional medicinal therapies have great results in the treatment of rosacea. Rosacea is a chronic inflammatory vascular disease of skin and eye that affects 0.5–10% of the population [1–3]. This disease is more common in women aged 30–50 years, and it is racially more prevalent among Caucasians living in the North and East Europe . Symptoms include erythema of the central face, flushing on the cheeks, tingling, itching, and inflammatory lesions in the form of papulopustular, telangiectasia, and phymatous changes. The factors that trigger the disease include sunny, warm weather, wind, alcohol, spicy foods, stimulating drinks, moist air, topical steroids, and stress [4, 5]. The cause of this disease is not completely understood, but genetics [6, 7], an overgrowth of bacteria in the small intestine , increasing antimicrobial peptides , infection with H Pylori , Chlamydia and Staphylococcus epidermidis , increased mast cells in the dermis , and increased activity of Demodex mites in the skin [6, 11] are considered the causes of the development of this disease. Common subtypes of rosacea include papulopustular, erythematotelangiectatic, phymatous, ocular and uncommon subtypes include fulminant, granulosa, and neurogenic that has shown in Figure 1 [1, 5, 8]. Diseases such as acne vulgaris, steroid rosacea, SD, perioral dermatitis, contact dermatitis, and lupus are placed in the differential diagnosis of this disease . There is no certain cure for it and there are more symptom controllers . Treatment includes topical application of Metrogel, azelaic acid, combination of sulfacetamide 10% and sulphur 5%, oral antibiotics of tetracycline family, oral isotretinoin, and vascular laser therapy [1, 4]. Long-term use of topical and oral antibiotics has side effects such as skin irritation, itching, scaling, digestive problems, drug interactions, allergy to sunlight, headaches, and dizziness. Prolonged and continuous use of isotretinoin leads to hepatotoxicity, teratogenicity, hyperlipidaemia, musculoskeletal changes, night blindness, and a variety of mood changes such as depression . Due to the length of the disease and the mentioned complications, herbal remedies have long been used as an uncomplicated, low-cost, and fast-acting alternative to treat this disease . Kim et al. (1999) have confirmed chicory inhibitory effect on mast cells through laboratory studies . In a study by Saeedi et al. (2003), a cream containing liquorice products (glycyrrhizic acid) was used in the treatment of atopic dermatitis for two weeks, resulting in significant improvement in oedema, pruritus, and erythema . In the review study by Asgharpanah and Haghighat (2012), anti-inflammatory, antioxidant, antibacterial, and opiate effects of jujube have been confirmed . In the study by Street et al. (2013), anti-inflammatory, anti-bacterial, hepatoprotective, and cardioprotective effects of chicory have been proven . According to Renta David (2013), the anti-inflammatory effect of cream containing mallow, chamomile, and marigold on various skin lesions has been demonstrated . Moreover, Jessica Wu (2006) has confirmed the effects of Zinc liquorice, feverfew, tea tree oil, green tea, oatmeal, lavender, and camphor oil in the treatment of rosacea . In the investigation of Iranian traditional medicine texts in the discussion of oram and bosore, based on apparent similarities of homreh lesions and clinical signs, it seems that homreh has similarities with rosacea. Its agent is blood corruption with increasing yellow bile. The use of refrigerants such as chicory, mucilage.of ispaghula (Psyllium), lettuce, and cool syrups such as sekanjabin and refrigerant bandages on the surface of the lesion in the treatment of the disease has been recommended . 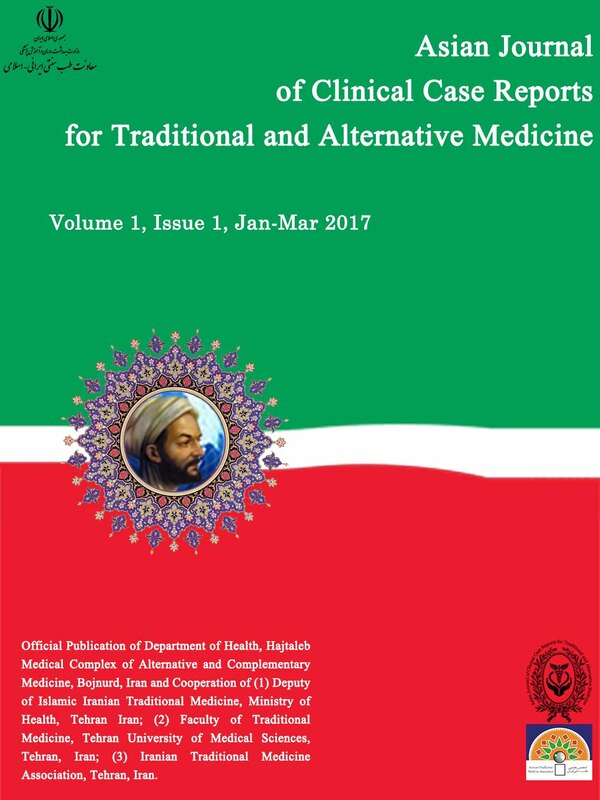 The aim of this study is the introduction of rosacea patients referred to the clinics of traditional medicine clinics of Tehran University that, had significant improvement in the short term with traditional medications and dietary advice. The patient was a 62-year-old man from Tehran who was referred to Tehran University's traditional medicine clinic at Khark Street with redness and pustules on the face. The patient’s face started becoming red years ago, but the redness has increased in the past six months and lesions have appeared in the form of pustules. In other areas of the body, there was no lesion and no history was mentioned. In all that time, he consulted multiple doctors and medication was prescribed for him with a diagnosis of rosacea, but he did not use any drugs. In the patient's family, there was no history of a similar disease or of eczema and allergy. Papulopustular lesions were observed on examination of clear redness of the bridge of the nose and cheeks. Notable points in the examinations were high triglyceride levels, and other routine tests were normal. Our case was visited by a dermatologist and diagnosis of acne rosacea was confirmed. 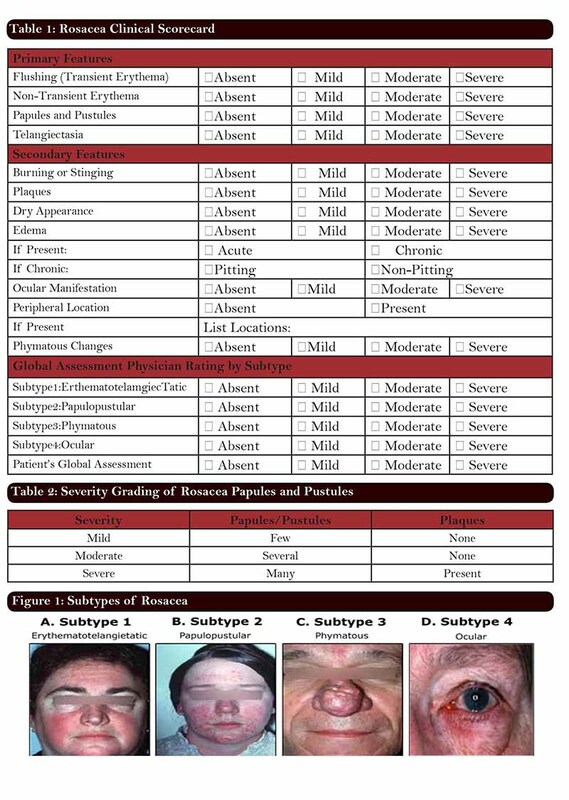 Based on the early symptoms including redness (transient erythema), persistent erythema, papules, pustules, telangiectasia, and secondary symptoms such as a burning sensation, presence of plaque, skin dryness, oedema, nephropathy, and phymatous changes, rosacea is divided into mild, moderate, and severe types (Table 1). According to the symptoms and the presence of plaque, our patient is in the severe group (Table 2). At next stage, the patient was visited by a specialist in traditional medicine. In interviews and visits, the patient complained of itching, irritation, and redness. This increased with the consumption of fatty foods, sweet and pungent spices, and due to the incidence of lesions in the face he was having trouble with social communication. In the questions, the patient complained of severe bloating after eating, especially after eating cold food, difficult defecation once a day, and lack of full discharge and runnynight spittle. These indicate the causes of cold and moist temperament in the stomach, intestine, and bowel. Slim white-head pimples were visible in the cheek and nose areas. In examination after pressing and drop of lesion the redness was removed of the skin colour and again was inclined to white. This indicated increased body temperature without increasing blood. In the examination of tongue, loss of papillae and increase white-load was evident on the tongue, which still was the sign of coldness and moisture in the digestive system. There were signs of surfeit in the patient's pulse. Health and nutrition regimes were recommended at first because of gastrointestinal problems are, prohibited concentrated foods and due to the type of skin lesions that is a sign of increased virulent yellow bile the prohibition of bile stimulating and producing foods. Aftimoni whey protein with Sisymbrium irio should be consumed hot at fasting, Liver capsule (coriander seed, fumaria, lettuce seed, chicory seed, Jujube, Rhubarb root, cassia leaf, thyme), sekanjabin (fennel, chicory seed, celery seed, Tribulus terrestris, cumin, Khyarin seed, chicory root bark, fennel root bark, capparis root bark), and local mask containing mallow, mallow flowers, and chamomile flowers were administered along with milk and two drops of lemon juice. Two months later, the patient was referred to the clinic for another visit. According to the patient’s description, irritation and redness were improved by 70%. There was a delay in lesions, and the recovery rate was even better. Papulopustular lesions also decreased. In the examination by a traditional medicine specialist, decrease liver surfeit in pulse was confirmed. Symptoms of mucus on the tongue improved, but the salty mucus was still evident on the tongue. Rosacea is a chronic skin disease with bothersome symptoms and a high rate of prevalence. Most of these lesions are observed on the face. There are several treatments leading to many complications. That's why patients have turned to the use of herbal medicines and complementary medicine . Several studies have been conducted to treat rosacea with herbal medicines. Studies have proven oral and topical therapeutic effects of plants such as chicory, jujube, liquorice, mallow, chamomile, and marigold have been proven [13-18]. Based on traditional medicine references, mashara and homreh are very similar to rosacea in terms of symptoms. Given that throbbing pain is concomitant with mashara that it was not mentioned in the rosacea, thus, homreh is a disease with the most similar characteristics with rosacea that affects mostly the face. It first affects the nose and then spreads all over the face. Tabari says: "The cause of the homreh disease is blood corruption with increased virulent yellow bile in a way that little yellow bile mixed with blood and spread to the underneath muscles followed by capillaries ruptured and symptoms appear in the form of redness under the skin. Also this disease initiates with frequent consumption of foods and hot spices such as garlic, pepper, salty foods and honey” . Based on the cause and location of lesions and symptoms, there are many similarities between the two diseases. As rosacea has multiple subtypes, erysipelas is divided into two forms based on the materials created such as pure bile and bile mixed with diluted blood. As Tabari says, based on the type of material, plurality, and severity, the disease could spread on the surface or the depth. Based on the book Eksir-e-Azam, the use of refrigerants including chicory, fleawort, lettuce, purslane leaves, coriander seed, and refrigerant bandages on the surface of lesions in the treatment of homreh has been recommended . In the book Zakhire Kharazmshahi, homreh’s treatments include bloodletting, expelling a lot of blood, cool drink as sikanjebin and sour syrup, etc. and poultice include lentils peel and plantain leaf and wholegrain dried bread and vinegar cooked sour pomegranate and soft powder. In this case, according to the examination that there were surfeit and symptoms of severity, treatment based on acute liver cleansing and surfeit removing began accordingly Aftimoni whey protein was selected for the following reasons. 1. Most laxatives come in the form of cereals and culinary items, and otherwise they taste and smell bad. Whey protein, on the other hand, does not have these properties. 2. Most laxatives for temperament distance from human nature will not be void of disadvantage (which is close to the equinox) after entering the body and applying the qualities of the drug, and whey protein is not (because whey protein is mild and harmless). 3. When laxatives, particularly some strong ones, fail or remain inert in the body, they cause corruption and are the source of other diseases, whereas when whey protein remains in the body, it becomes body food. 4. Unlike other laxatives, whey protein is quickly absorbed and penetrates deep to reach the desired organ. 5. If other laxatives remain in the body unused, they cause harm, but whey protein does not cause diarrhoea and ripens the matter with fat and prepare it for disposal. 6. Frequent drinking of it is not harmful, but other laxatives when repeated reduce strength and good humours. 7. As most people are not used to laxatives, strong laxatives in these people will cause harm except. But this is not the case with whey protein, which creates diarrhoea and also modifies the temperament, and these two traits are also rarely found in other laxatives. 8. Alternatively, whey protein removes dense and dirty material gradually, thereby making the body moist . Liver capsule and bozory sekanjabin were prescribed to rid the body of waste, open pores in the liver, reduce liver and blood acuity, and facilitate excreta disposal through urine. The patient was re-examined after two months and showed 70% recovery. Owing to the significant improvement in our patient’s condition, it seems that temperament reform through recommendations and regimens, as well as herbal medicines prescribed according to sources of Iranian traditional medicine, play an important role in the development of rosacea symptoms. This study should be a useful guide for future clinical studies of this disease. This article is the outcome of treatment measures by AA, FE, and MK cooperated in documenting and writing the article. Chang BPC, Kurian A, Barankin B. Rosacea: An Update on Medical Therapies, Skin Therapy Lett 2014; 19(3):1-4. Brittney C, Scheinfeld N. Rosacea: A Review, PT 2009; 34(1): 38-45. Goldgar C, Keahey D, Houchin J. Treatment Options for Acne Rosacea, Am Fam Physician 2009; 80(5):461-68. Steinhoff M1, Buddenkotte J, Aubert J, Sulk M, Novak P, Schwab VD, et al. Clinical, cellular, and molecular aspects in the pathophysiology of rosacea. J Investig Dermatol Symp Proc. 2011; 15(1): 2-11. Anne Lynn S Chang, Inbar Raber, Jin Xu, Rui Li, Robert Spitale, Julia Chen, et al. Assessment of the Genetic Basis of Rosacea by Genome-Wide Association Study. J Invest Dermatol. 2015; 135(6): 1548–1555. Feldman SR, Huang WW, Huynh Tu T. Current Drug Therapies for Rosacea: A Chronic Vascular and Inflammatory Skin Disease, Journal of Managed Care Pharmacy 2014; 20(6):623-29. Z. Ðakovic, S. Vesic, J. Vukovic, S. Milenkovic, K. Jankovic-Terzic, S. Ðukic, et al. Ocular rosacea and treatment of symptomatic Helicobacter pylori infection: a case series, Acta Dermatoven APA 2007; 16(2):83-86. MutoY, Wang Z, Vanderberghe M, et al. Mast cells are key mediators of cathelicidin-initiated skin inflammation in rosacea, J Invest Dermatol 2014; 134(11): 2728-36. Yücel A, Yilmaz M .Investigation of the prevalance of Demodex folliculorum and Demodex brevis in rosacea patients, Turkiye Parazitol Derg 2013; 37(3):195-98. Batra M, Bansal C, Tulsyan S. Granulomatous rosacea: Unusual presentation as solitary plaque, Dermatol Online J. 2011 Feb 15; 17(2):9. Kim HM, Lee EH, Cho HH, Moon YH. Inhibitory effect of mast cell-mediated immediate-type allergic reactions in rats by spirulina. Biochem Pharmacol. 1998 Apr 1; 55(7):1071-6. Saeedi M, Morteza-Semnani K, Ghoreishi MR. The treatment of atopic dermatitis with licorice gel. J Dermatolog Treat. 2003; 14(3):153-7. Asgarpanah J, Haghighat E, Phytochemistry and pharmacologicproperties of Ziziphus spina christi (L) Willd, Afr. J. Pharm. Pharmacol. 2012; 6(31): 2332-39. Renée A. Street, Jasmeen Sidana, Gerhard Prinsloo. Cichorium intybus: Traditional Uses, Phytochemistry, Pharmacology, and Toxicology. Volume 2013, Article ID 579319, 13 pages. Dawid-Pa R. Medicinal plants used in treatment of inflammatory skin diseases, Postepy Dermatol Alergol 2013; 30(3): 170-77. Jessica Wu. Treatment of rosacea with herbal ingredients, JDD 2006; 5(1):29-32. Nazem Jahan Mohammad Azam. Eksor-e-Azam. Teharan: Iran University of Medical Sciences, Institute of Medical History, Islamic and Complementary Medicine; 2008. Wilkin J, Dahl M, Detmar M, Drake L, Liang MH, Odom R, et al. Standard grading system for rosacea, report of the National Rosacea Society Expert Committee on the classification and staging of rosacea, J Am Acad Dermatol 2004; 50(6): 907-12. Khansari MM, Meftah alshafa. Tehran: Iran University of Medical Sciences Institute of Medical History, Islamic and Complementary Medicine; 2009.